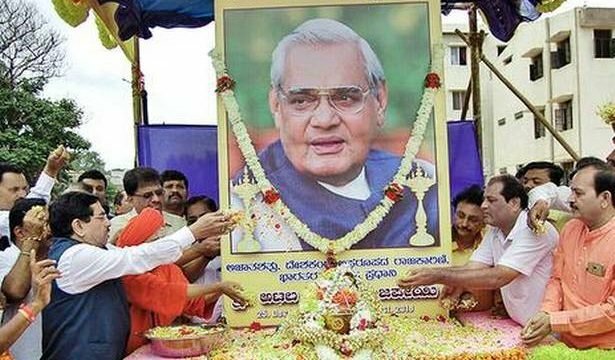 An urn containing the former Prime Minister Atal Bihari Vajpayee’s ashes reached Hubballi on Friday and scores of people paid tributes to the departed soul. As the urn reached Moorusavir Mutt School premises, Sri Gurusiddha Rajayogindra Swami, seer of Moorusavir Mutt, Member of Parliament from Dharwad Pralhad Joshi, MLC Pradeep Shettar, the former MLA Veerabhadrappa Halaharavi and others paid floral tributes. Recalling his association with Vajpayee, Mr. Joshi said that Vajpayee’s words inspired many. He recalled that although he had entered Parliament for the first time, Vajpayee had encouraged him to participate in parliamentary debates. Mr. Joshi said that the Congress had no moral rights to criticise the Asthi Kalash Yatra [of Vajpayee] as it was in the country’s tradition to pay respects to great leaders. Mr. Halaharavi recalled his first meeting with Vajpayee in 1986, when he had gone to New Delhi as part of an ABVP delegation. Later, the BJP leaders and Vajpayee fans took out the Asthi Kalash Yatra on the thoroughfares of the city raising slogans such as Atal Ji Amar Rahe. Subsequently, the urn was kept at the Kittur Chennamma Circle to allow the public to pay tributes. From Hubballi, the urn was taken to Haveri and later in the evening, it reached Gadag.